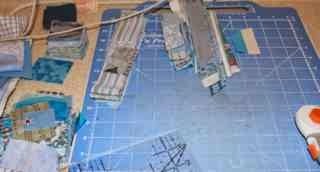 This has been my blue scrap cutting center for the last week. I kept thinking I would get back to it during the week, but something else always seemed to come up in the evenings. 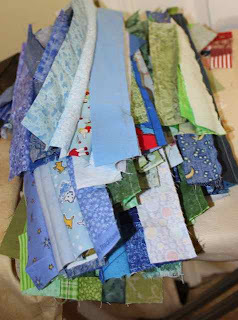 Today should be good though for getting some more scraps cut -- maybe I will even sew something! Shocking yes? I hope you have all been more successful in your scrap busting endeavors this weeks. Use misterlinky below to share your projects. Still two more baby blue Saturdays left this month. How are your scrap using efforts going? Use misterlinky below to share your progress. I have a Lego meeting this morning a play practice this afternoon, but maybe the evening will bring some sewing time? I hope so. I spent some time sorting through the 1.5 inch strips for postage stamp blocks. These happy little guys are sets of 6 that have now been ironed and sub cut. 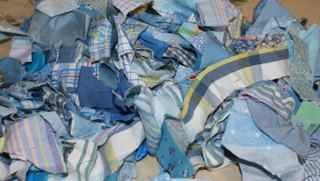 Maybe today I will put them together into blocks? I hope to have some sewing time but first there is a lego meeting that I am supposed to run while Kurt is off helping to coach Ryan's football team . I am trying to convince him that we are all over scheduled, but he isn't on board quite yet. What scrap-happiness have you been up to this week? Use misterlinky below to share your progress. I can never get to the bottom of my blues. 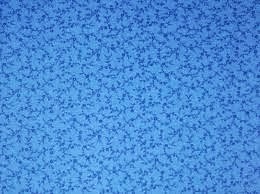 It seems to be everyone's favorite color and has become my default for any quilt that goes to someone I don't know that well. I've already made a big dent in the bright blues and taken another month for the greenish hues, so now these pastel beauties are all that remain. I think they will make a nice sparkling addition to my rainbow scrap projects. I know some of you are hesitant to break out of your rainbow bright pattern, I always go back to my favorite thought about scrap projects though. They are already scraps, what is the worst that can happen? Give it a try, you might like the addition of pastels, but if you don't, then don't feel the pressure to include it in your final project. At least you have used up some random bits, and you can always add some blocks to your orphan collection. On a more personal note, I am missing quilting and bloggging and hope to have more time and energy to settle back into a routine now that school is getting into a pattern. I got the sweetest e-mail yesterday from someone who said she enjoyed my little slices of daily life and hoped I could get back to Dear Jane soon. I hope I can get back to them too. As much as I love my job, I can't let it take every bit of my time and energy leaving me comatose at the end of every day. I'm still working to find a balance that will let me enjoy the rest of what life has to offer. Now, in direct contradiction to that wish, I'm off to a kickoff event for Lego Robotics this morning before taking Anna to practice for the school play. I'll stay in my classroom while she does her thing and try to cross some of "to dos" off my list. I can just about handle the regular planning and grading, but a slew of extra paper work has got me feeling a bit like I've fallen off a steep cliff. We've been saving the pastel shades all year. This is the time to dig them out. With bright blue and teal already spoken for, there should be some baby shades hanging out in the bottom of your basket. Sorry for the delay in getting the word out. I picked up some bug while we were out of town this weekend and stayed home sick yesterday. Each new school year seems to bring a brand new set of germs. One of the benefits of teaching I suppose.